The east end of Glasgow is hardly synonymous with fruit trees and apple picking. But one woman, along with a group of local volunteers, is trying to change that. Last year, they planted an orchard in Alexandra Park and it has just been named one of the top community orchards in the UK. "It brings people together to learn about their food," says Clem Sandison, founder and director of the Alexandra Park Food Forest. People might think you can only buy apples in a supermarket, or that they can't be grown in Scotland, Clem says. She hopes the food forest can show them this is far from the case. "It gives them an opportunity to actually see things growing, to know about seasonality," she says. "It gets them a chance to get their hands dirty, learn about the soil, learn about wildlife and biodiversity and really get involved." The food forest currently has 74 trees, producing fruits and nuts including pears, plums, mulberries, blueberries, walnuts and hazelnuts. It aims not only to grow trees and bushes, but herbs and produce such as rhubarb and artichoke which grow in the ground. It has just won £500 in Helping Britain Blossom's community orchard competition, which will be put towards buying more unusual crops for the forest and funding events and workshops. Clem lives in Dennistoun and used to visit Alexandra Park with her daughter. 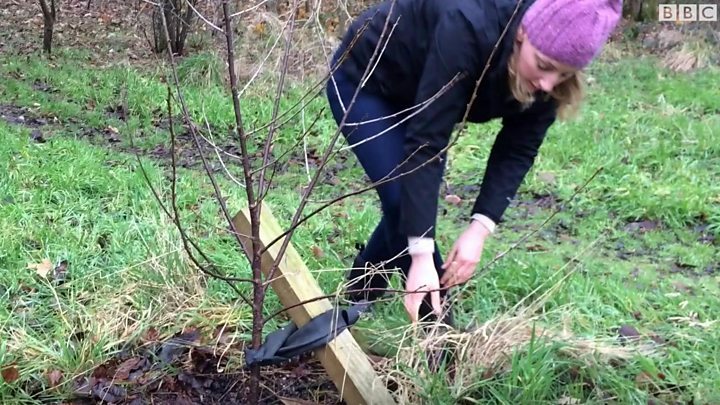 She was inspired to create an orchard there after getting involved with The Orchard Project, which helps communities across the UK to grow their own fruit. After receiving advice and training from experts, she got a group of 100 local residents together to plant the trees. Five local primary schools also became involved in the planting. Clem now runs wildlife walks and workshops in the food forest to help children learn about where their food comes from. Fergus Walker is the Glasgow co-ordinator for Helping Britain Blossom, a project which supports community orchards across the UK. In addition to Alexandra Park, he manages orchards in Glasgow Green, the Gorbals, North Kelvin and Aberfoyle. Two more are being planted in Springburn and Ruchazie this winter. "It's a project about building community and helping people realise all the benefits of having a space like this, somewhere which is nice to be," he says. He adds that it is "a chance for communities to really have a space that's their own". "A lot of parks are quite underused," says Clem. "There's a lot of green space but maybe there's more space for trees and for fruit production. So it was really to create a model for how parks in Glasgow could do that kind of thing." For Clem, this is part of reviving Scotland's fruit growing heritage. Although Scotland used to have a lot of commercial orchards, Clem says that cheaper competition from abroad led to a slump in Scottish fruit production. But in recent years community orchards have aimed to reignite that tradition. "It's really exciting to discover all the heritage that Scotland has in terms of fruit growing and discover how much you can get," says Fergus. "Because actually when you go to the shops it's virtually impossible to get Scottish apples." "There's something very satisfying about being able to produce your own," he says.